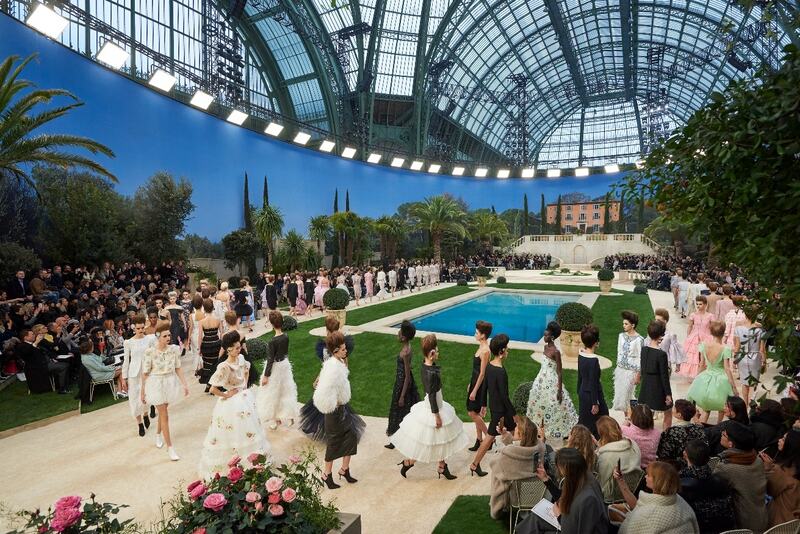 This season, the Grand Palais becomes the vast Mediterranean garden of a beautiful, big house. A pool of water is surrounded by trees and Southern plant species in a harmony of neat lines. Pathways are almost “à la française”, like 18th century gardens. Indeed, it’s this period, his favourite, that has inspired Karl Lagerfeld, and in particular the talents of the marchands-merciers and the savoir-faire of the artisans of French luxury. Among the artistic themes of that century, flowers play an important role. Now, they are at the heart of CHANEL’s Spring-Summer 2019 Haute Couture collection, embroidered, painted, in lace, in feathers, in resin and also in ceramic, they appear even as hair jewels. They explode in bouquets of pastel pink, prairie green and sky blue, and in games of black, white, beige, navy blue, iridescent gold and silver. “It’s a serene, ideal, timeless collection, that’s absolutely now, with new shapes”, says Karl Lagerfeld. Two silhouettes stand out, perched on strappy pumps revisiting an 18th century shoe. The first is long and slender: the head held high above wide boat necklines and supported by shoulders split with a hollow fold, both slightly rounded and pointed, highly graphic. Following the line of the body, lengths run to mid-calf. The second is more flowing with voluminous bell and corolla shapes, full skirts and the bust enveloped with straight or balloon sleeves. Sometimes, the fullness of a bust crosses the tubular line of a skirt or trousers and vice versa. Like a central theme, one construction detail comes up every time: a collar or panel of a dress turned inside out, a rounded fold adorning a jacket, a skirt or a neckline, creating trompe-l’œil and new volumes. The dresses and the suits are very refined. On shouldered jackets with boat necklines and on the zip-up skirts that fall to mid-calf, or wraparound skirts cut to the knee, the braid quite literally melts into the fabric: embroidered into the tweed, the lamé wool or the grain de poudre, it further amplifies the pure line of what Karl Lagerfeld is calling “the new CHANEL”. Certain jackets are lengthened like tunics, while others with no collar but a folded lapel, geometric or asymmetric, adopt a double row of buttons. Some, belted high, are extended from a peplum or, conversely, shortened like spencer jackets or aged leather jackets, occasionally warmed with feathers. On the dresses, reversed collars give the impression of a bolero. Here the braiding highlights the hyper graphic structure of the silhouette. The reversed pleat reappears on the bust and the hem of the dresses with big bell skirts in matt satin: pulled to the waist, opening like petals at the front or over the hips, they are lined with a second colour or with floral seedlings. Other dresses in sequinned silk faille are adorned with a lateral train inversed and flounced in lace, raised to the waist. A big dress with a pink lace skirt painted by hand has balloon sleeves finished with flat bows and ruffles cut into the serrated edge of the lace. Another in hand-painted blue lace is embroidered with ribbons laid like stripes. A flounced godet lengthens a skirt worn with a peplum top. The skirt of a suit in crêpe lamé is embellished with a burst of torn tulle. In tune with the frivolity of 18th century style, the “lingerie” dresses in white pleated chiffon are interspersed with ennobled lace, ruffles and ladder lace. A dress in pleated chiffon slit with entre-deux lace is worn with a very structured leather jacket, for a contrasting and ultra-graphic silhouette. On the same principle a sequinned tweed skirt is coupled with a little cape covered with feathers and fastened at the neck with a leather bow. The ateliers reveal here the treasures resulting from such patience and savoir-faire: on these dresses, every horizontal blind tuck is completed by hand, taking up to 350 hours of work. On one organza dress embroidered with flowers made from feathers, the organ pleats that animate the ruffles are gathered thread by thread. The smocked lozenges of a silk blouse are sewn by hand and held in place by 650 beads. A black leather dress cut in spirals is aerated by ladder lace. An entirely sequinned white suit embroidered with patterns inspired by the porcelain of the Manufacture de Vincennes is a veritable work of art. An organza dress with a bolero effect is embroidered with real flowers immortalised in resin. Finally, a long green sequinned dress is embroidered with hand-painted ceramic flowers. 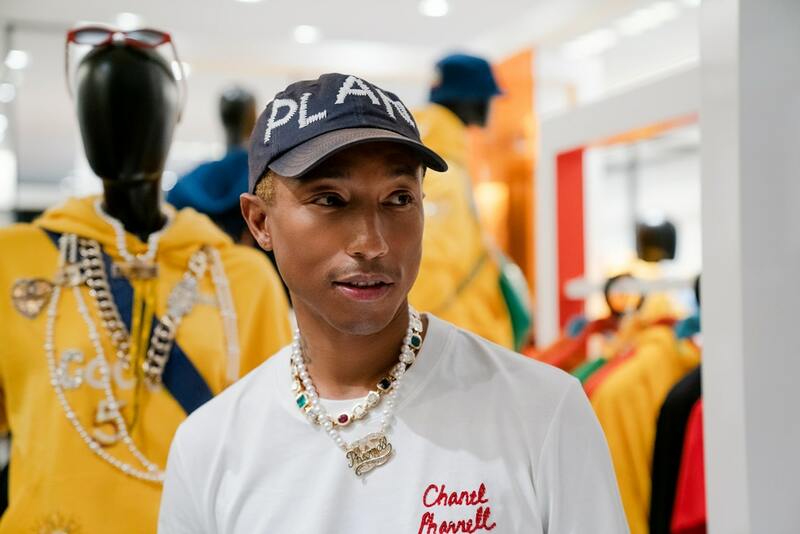 The CHANEL 2019 Spring-Summer 2019 Haute Couture show was applauded by the ambassadors Kristen Stewart, Pharrell Williams, Tilda Swinton, Marine Vacth, Anna Mouglalis, Alma Jodorowsky and Caroline de Maigret, as well as the director Sofia Coppola, the actresses Tessa Thompson, Marion Cotillard and Carole Bouquet and the singer Chris.